Steve G. Jones, Ed.D., Clinical Hypnotherapist, charges $1,500 for a custom recording and $25,000 for a one-hour private hypnotherapy session at his office. But you can get all the benefits for this low price. Simply listen to the Fear of Falling Hypnosis MP3 every night as you go to bed for three weeks and feel the changes happening in your life. You will feel more empowered, more in touch with your true self, and you will truly know that your goals are within your reach. Steve G. Jones achieves AMAZING and LASTING results!!! Hypnosis is the easiest way to affect change in your life because the positive messages go straight to your subconscious mind effortlessly so you can accomplish your goals and reach for the stars!! All you have to do is listen to the Fear of Falling Hypnosis MP3 download at night as you go to sleep!!! You’ll hear soft music, the gentle sounds of the beach, and the soothing sound of Steve G. Jones’ voice all working together to bring about positive changes in your life easily and naturally. 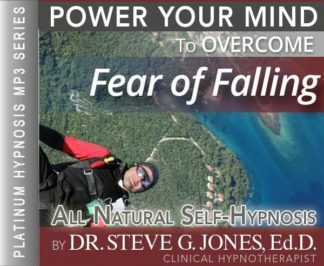 Steve G. Jones has been helping people improve their lives with hypnosis for over 17 years…now it’s time for him to help YOU with the Fear of Falling Hypnosis MP3 audio… don’t wait, do it NOW !!! you’ll be glad you did. See you at the top! And as you continue relaxing deeper, deeper, and more deeply relaxed, you realize just how confident you are in every situation. You are confident in every situation. Day by day your balance is becoming better and better. This is true because you believe it to be true, because by believing in things, things which relate to our capabilities, we can make them come true. So you believe that your balance is improving day by day and because you believe this, it is true. Therefore you are relaxed in every situation that has to walking, standing, navigating, navigating your way through your world. In the past you have been afraid of falling, now you embrace a new relationship, a new relationship with you abilities. You realize that you are fully capable of maintaining your balance. Your abilities to walk, stand up straight, to sit in a balanced manner, all of these things are improving day by day. Anything which in the past caused you to be afraid of falling, you are letting go of. Certainly we have all fallen in the past, but that does not predict the future. I want you to see a future of which you are free of this fear of falling. Let that fear go now. By doing this, you realize that there will be many more opportunities for you. Many more opportunities for you to go places, even if you are just navigating around your home. You will have the freedom to do so without fear. So let go of fear now, feel it leaving now. Feel that fear being afraid of you. Fear is leaving you, going far, far away allowing you to be free of the fear of falling. Instead, you embrace a new joy concerning life, a new curiosity permeates your existence. You are interested in going places and doing things, standing, walking, all in a balanced way. Because you are able to physically balance yourself easily in every situation. Now, you realize that taking excessive risks is not a good idea. You take only calculated, logical chances, doing things you know you can do. because of this, you can trust your ability to be free from falling. You can trust your ability to walk in a balanced way, to stand in a balanced way, to sit in a balanced way, to navigate through your world in a balanced way, because you take necessary precautions, you let go of the fear of falling. Because of this very logical approach, you relax, you relax. You enjoy life, look at life as an adventure as you should. So I invite you to relax now and embrace the new you, the new empowered, relaxed you. Congratulations, in making this powerful decision to be relaxed and let go of the fear of falling. Many people have the fear of falling because their balance is off, they frequently experience dizziness, and/or they have fallen before. The good news is that hypnotherapy can help you. Whether you have a medical condition that causes you to be uneasy about falling or not, the Overcome fear of Falling self-hypnosis program can help you overcome your fear. The Fear of Falling Hypnosis MP3 recording will tell your subconscious mind to be more stable on your feet. You will be given very powerful and positive suggestions that will help you overcome your fear and actually feel more secure with your balance. Hypnosis can help future falls from occurring by making your more steady on your feet. This powerful hypnosis session will also help you feel more confident in yourself so that you do not fear falling. If you have fallen before, you will be programmed to let go of that fear that the fall created. You will learn to trust your mobility and your balance. You do not have to fear falling any more when you listen to this hypnosis program. You can feel safe and secure with your balance. We suggest you listen to this Fear of Falling Hypnosis MP3 recording for 21 nights in a row before going to bed at night. Many people notice their fear diminishes after just one session! Realize that you do not have live in fear of falling any more when you can overcome your fear with hypnotherapy.